Updated Sunday December 13, 2015 by Carlos Torres. 1) Initial playability of the fields is determined by the President, the respective league Vice Presidents, and/or Player Agent (or his designee) upon arrival at the fields or as early as possible during gamedays. Once the umpires take the field, that responsibility is then shared with league representatives. The league will notify on our website homepage, Facebook page, Twitter feed, emails, and text messages to all coaches, teams, and family members, etc., if weather conditions and fields are unplayable. 2) When weather is approaching/imminent, league representatives will stay in close contact with one another while using weather/lightning apps and standard lightning detectors available to them. We also have the benefit of real time radar on our phones as well. 3) Umpires have ultimate authority while games are being played. If one field is cleared because of weather/lightning, all fields will be cleared for 30-minute intervals, as per city ordinance. Once the fields are cleared, the umpires will consult with the league representatives to get clarification on how close the bad weather is. If it is deemed that the lightning is ten miles or more away, play will be allowed to continue once the 30-minute interval is complete. 4) When lightning is not visible, we will use single digit lightning/mileage indicators as our yardstick. 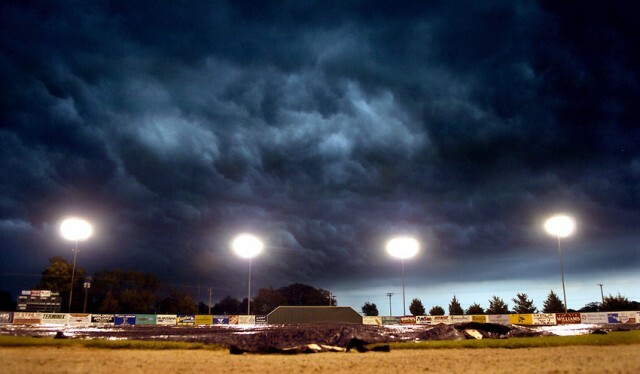 If the inclement weather is inevitable (or lightning is less than ten miles away), the league representatives will alert the umpires to clear the fields until the inclement weather passes. 5) The league representatives will have the responsibilty of determining if the game should be played, delayed, or rescheduled. This determination should not oridinarily delay the start oif a game for more than one hour. If games are rescheduled, they should generally be played on the next available open date on the same field and in the order in which they were rained out. 6) Only applicable to Major & Minor Leagues: Only under extreme exigent circumstances, and with the approval of the Board of Directors, will a team be scheduled to play more than three games in a single week. A week is defined as beginning on Monday and ending on Sunday. Games that are started but not completed, shall be handled under Cal Ripken tournament rules; that is, other than when the slaughter rule applies, games shall be six completed innings, unless the home team leads at the end of 5½ innings of play or in the case of a tied score after six completed innings when extra innings are played. In the event a game is called before completion, it shall be completed from the point of discontinuance. volunteers of the league will not be compromised.